NOTE: This post was originally a page on the blog located at mHealthInsight.com/DHF13. The event has now concluded and the page has been converted into a post dated to the close of the meeting. We would like to thank everyone who contributed to make the meeting and networking such a success especially the great speakers, sponsors, organisers and enthusiastic delegates who I have no doubt will be better placed now to make mHealth investments. 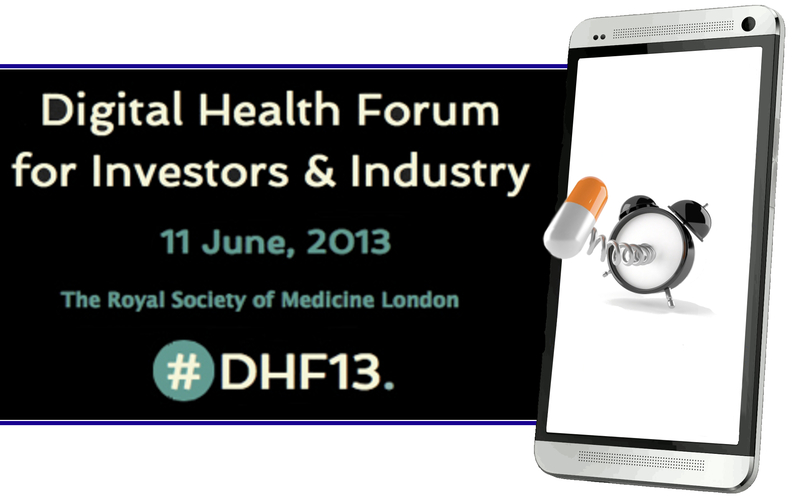 Join us at the Digital Health Forum (DHF13) at the Royal Society of Medicine in London (UK) on the 11th June 2013 where you will get an opportunity to meet with a showcase of the best ‘deal-ready’ digital health companies from around the world. We’re excited to have been invited to contribute with a dedicated mHealth stream that will introduce some of the unique dynamics that the newest mass media brings to Digital Health before sharing what we think are the most exciting mHealth investment opportunities from around the world. DHF13 is a digital health investor/partnering conference that is designed to identify and attract ‘new money’ – both investors and partnering companies – who have a specific and deep interest in the emerging digital health sector with the aim of creating an environment that will support significant investment and partnering opportunities. The DHF13 program will achieve this by helping delegates identify current investment/partnering opportunities in the rapidly emerging world of digital healthcare and connect these with investors who may not have traditionally been associated with the healthcare sector but who are actively seeking to get involved in the unprecedented opportunities that are emerging as the Healthcare industry at large keeps pace with the exponentially advancing opportunities that consumer digital technology can enable. DHF13 is an invitation only event. If you would like to attend as a delegate but haven’t yet received a formal invitation email please click here to apply. If you are a founder/CEO who would like to present investment opportunities in your deal-ready mHealth company at DHF13 please click here to apply. If you would like to sponsor DHF13 or suggest a commercial partnership opportunity please click here to make contact.